Pegasus NEE-01 the first of two HD TV CubeSats built in Ecuador is planned to launch on a CZ-2D rocket from the Jiuquan Space Center on Friday, April 26 at 0413 UT. An EXA announcement said NEE-01 PEGASUS and NEE-02 KRYSAOR are the first CubeSats designed and developed entirely in Latin America, without help or support from abroad. “This is a major milestone in our history and the history of the region, now our space technology is qualified for Russian and Chinese launch vehicles and to survive the space environment. The satellites passed the tests without any problems and now we await the launch of the first, the NEE-01 PEGASUS in the first half of May and the second in the latter half of July” said Ronnie Nader, Director of Space Operations EXA and leader of the team that designed and built the satellite. 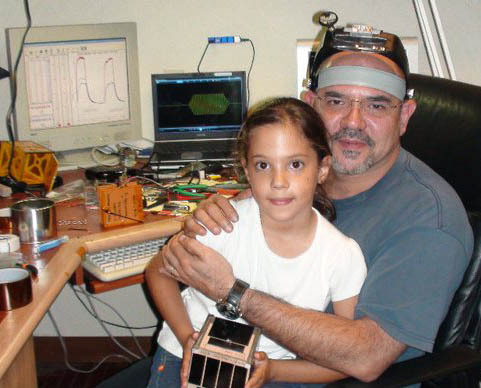 Both satellites were designed and built by EXA engineers who donated their work voluntarily, the Ecuadorian Government financed the launch and testing. EXA and the Ecuadorian government are engaging in ​​joint projects to ensure full utilization of the satellites, for both scientific and educational purposes. The launch of the NEE-01 had been scheduled for November last year aboard a Russian Dnepr rocket, but the launch was postponed to later this year, and it was decided to launch NEE-01 on a Chinese CZ-2D rocket. The satellites had to meet the launch requirements of both vehicles, which was a skill level higher than previously achieved by the Ecuadorian engineers. Source of text above: http://www.exa.ec/bp46/ translated by Google. Each CubeSat is just 10x10x10 cm (1U) and they have fold-out solar panels which give a total span of 70 cm. They will each carry a 0.9 watt output 720p HD TV transmitter and a beacon which will send a Morse Code ID, a SSTV image and Ecuador’s national anthem. It is understood that NEE-001 will operate on 910 MHz in the 33cm band, an amateur radio allocation in a number of countries, while NEE-02 will be in the 980 MHz band. Educational outreach is an important part of the project. EXA is partnering with three schools in Ecuador as part of the ASTERIA Program, in which students will use the satellite in their curricular and extra curricular activities. The satellite signal will be received and decoded by the EXA HERMES-A ground station in Guayaquil and then uploaded live to the Internet using Facebook and Twitter; the first signal will contain text book questions and the second will contain an image related to the question. If the students are able to answer the question correctly they will be granted access to the video camera on board the spacecraft and will be able to see Earth from space as the astronauts see it in their space missions. More advanced students will have access to the pure radio signal so they can try decoding it by themselves. There is also a HERMES-B ground station located in Kirch-Brombach, Germany. EarthCam has teamed up with the Ecuadorian Civilian Space Agency to deliver what EarthCam describe as an amazing viewing experience from an orbiting satellite. Mounted on the NEE-01 Pegasus, a live camera invites viewers to take a trip into space and explore the galaxy. EXA indicates that NEE-02 KRYSAOR is expected to launch on a Dnepr rocket from Dombarovsky near Yasny later this year. Ecuador is hoping to have two CubeSats in orbit this year. Their first CubeSat NEE-01 Pegasus will carry a 720p HD camera to send live video from space using a 0.9 watt TV transmitter in the 910 MHz (33cm) band along with a beacon that will send a Morse Code ID, a SSTV image and Ecuador’s national anthem. It was originally planned to launch on a Dnepr from Yansy but is now expected to fly on a CZ-2D rocket from the Jiuquan Space Center on April 26, 2013 at 0413 UT. 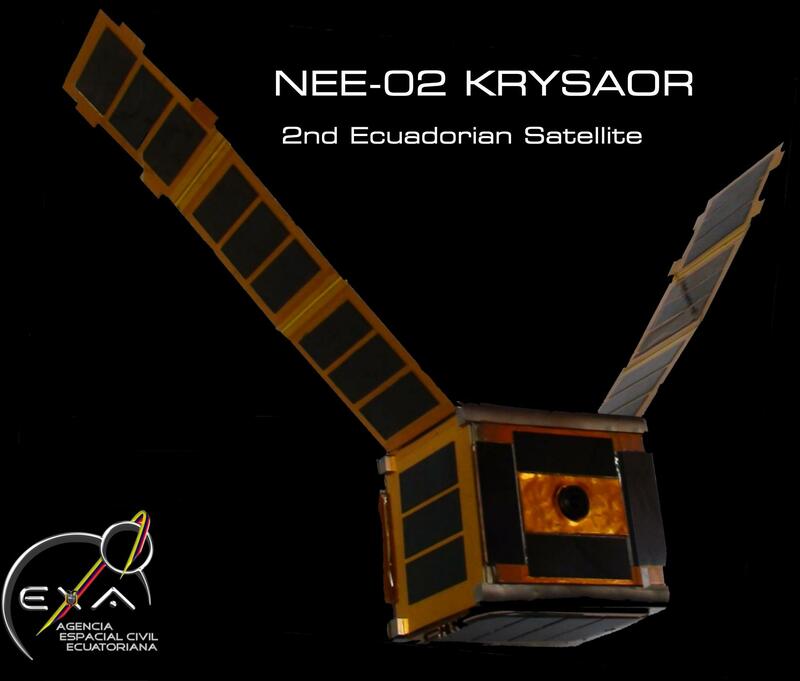 Ecuadors second CubeSat NEE-02 Krysaor carries the same payloads in the 910 MHz band as NEE-1 Pegasus but has a slightly different solar panel configuration. As yet websites such as Gunter Space Page give no indication on which rocket NEE-02 Krysaor will fly. Ecuador’s first satellite NEE-01 Pegasus, built by the Ecuadorian Space Agency EXA, is currently planned to launch in the 1st quarter of 2013 on a DNEPR rocket from Yasny. 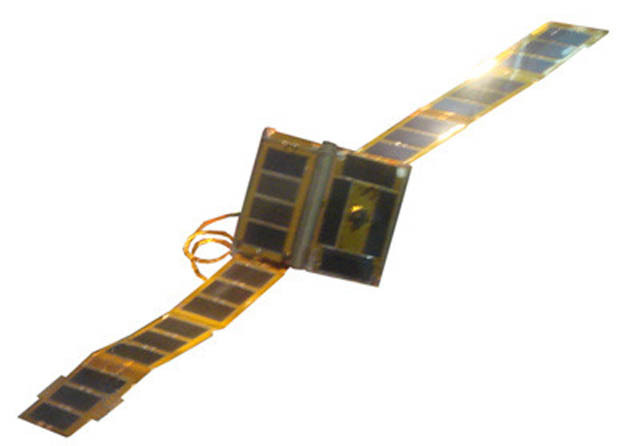 A Chinese rocket due to launch in the 2nd quarter of 2013 will carry CubeSat NEE-01 Pegasus from Ecuador. The NEE-01 Pegasus engineering team was led by Cmdr. Ronnie Nader, Ecuador’s first astronaut. The tiny 1U CubeSat (10cm cube) has a large fold-out solar array, a world first, and carries a 902 MHz band 720p HD TV transmitter, another world first for a CubeSat. Also operating in the same band will be a beacon that will send a Morse Code ID, a SSTV image and Ecuador’s national anthem. The raw aluminum structure of the CubeSat was donated by Professor Bob Twiggs KE6QMD. After launch the 10 by 10 by 10 cm NEE-01 Pegasus will deploy its 75 cm fold-out solar panels, the largest to be flown on a CubeSat. As part of the educational outreach objectives of the satellite video of the Earth taken by the HD camera will be made available to school students in Ecuador. The satellite will send two signals that will be received and decoded by the EXA’s HERMES-A ground station in Guayaquil and then uploaded live to the Internet using Facebook and Twitter; the first signal will contain text book questions and the second will contain an image related to the question. If the students are able to answer the question correctly they will be granted access to the video camera on board the spacecraft and will be able to see earth from space as the astronauts see it in their space missions. More advanced students will have access to the pure radio signal so they can try decoding it by themselves. The satellite featured in the July 15 edition of the El Murcurio newspaper. Ecuadors first satellite NEE-01 Pegasus is slated to launch from Yasny this October on the same DNEPR rocket as the AMSAT-UK FUNcube-1. NEE-01 Pegasus is a 1U CubeSat with two large (for a CubeSat) deployable solar panels and the Ecuadorian Civilian Space Agency (EXA) indicates 28.8 amps can be generated. There is an onboard camera to send live video from space from a 3 watt TV transmitter in the 902 MHz band along with a beacon that will send an ID and Ecuador’s national anthem. On April 25, EXA announced that it will be adding a mission to NEE-01 Pegasus: It will help monitoring near-earth objects from orbit using its onboard 720p HD video camera and will also help in the catalog and control of orbital debris (space junk), this new mission will turn the NEE-01 in to the first online, real time orbital video sentry for the planet, as the satellite has the capability to stream its video signal directly to the Internet. It is hoped NEE-01 Pegasus will be able to detect medium to small sized near-earth objects, like very small asteroids which are normally very difficult to detect but have enough mass to pose a threath to populated areas, like the one which exploded over California in April. Another of the satellites objectives is to serve as a space platform for elementary education. The satellite will send two signals that will be received and decoded by the EXA’s HERMES-A ground station in Guayaquil and then uploaded live to the Internet using Twitter and Facebook. The first signal will contain text book questions and the second will contain an image related to the question. If the students are able to answer the question correctly they will be granted access to the video camera onboard the spacecraft and will be able to see earth from space as the astronauts see it in their space missions. More advanced students will have access to the pure radio signal so they can try decoding it by themselves. The EXA will provide them with the appropriate support software free of charge.